At my home church, Belmont Chapel in Exeter, we have been working through a series in Ephesians. To supplement the weekly Sunday teaching my colleague, John Allan, has been adding additional material on-line. 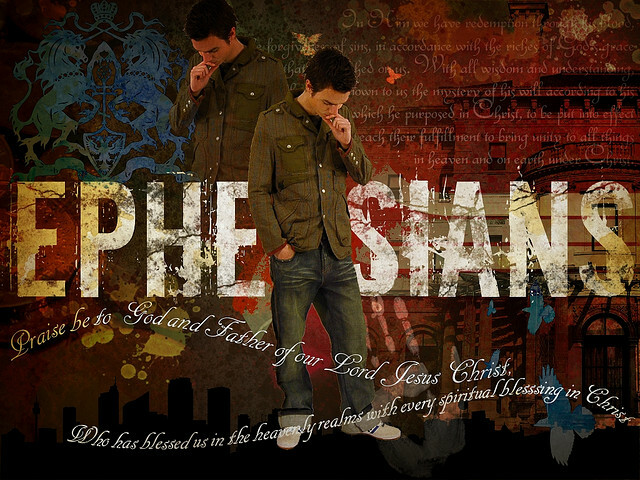 He has posted a series of bite-sized pieces of information about Paul’s letter at www.ephesiansdaily.org.uk along with longer articles at www.ephesians.org.uk. John has also been tweeting on the same subject. You can follow his posts at @ephesianstweet. SLIDE 1 William Randolph Hearst, the wealthy newspaper tycoon, invested much of his fortune in purchasing priceless works of art. One day, upon learning of the existence of an item which he very much desired to own, he instructed his agent to make enquiries as to its whereabouts. After some months of painstaking research Hearst’s agent reported back that he had managed to find that one particular artistic treasure. Upon enquiry, as to its location, the agent had the rather uncomfortable task of telling Hearst that what he was looking for was to be found in the private collection of no less a person than Mr William Randolph Hearst. This treasure had, so it transpired, been locked away in a warehouse for several years; Hearst had been searching frantically for treasure he already owned. SLIDE 2 I mention that story because I think it helps to illustrate the main theme of Paul’s prayer that concludes the first chapter of this NT letter that you’ve been considering together in your morning services these past few Sundays, the verses immediately before the passage we read a little earlier. And it also helps us, I think, to understand why it is that Paul unpacks for his readers that breathtaking resume of all the spiritual wealth that is theirs because they are now children of God; those earlier verses in Ch.1, from vs.3-14, that one long unbroken, unpunctuated Greek sentence. Paul’s point, surely, is to give his readers an inventory of all the personal spiritual wealth that is theirs; given to them freely to possess, by God, through the saving work of Jesus Christ. SLIDE 3 In fact, says Paul, all three persons of the Trinity were involved. The blessings of God the Father, reveal those who know and trust the Lord Jesus Christ as Saviour to be, adopted, blessed and chosen. The blessings of God the Son reveal them to be delivered, enlightened and forgiven. And the blessings of God the Spirit reveal them to be gathered and hallmarked. But all of these treasures need to be both understood and enjoyed if they are to make a difference in a Christian’s life, and so Paul prays for his fellow believers that they may know in greater measure the extent of the treasure that they already possess in Christ. The truth is that just like William Randolph Hearst all Christians throughout all generations are prone to forget what God has given them as treasure for their lives; we run the risk of looking for something we already own in Christ. SLIDE 4 And, I guess, one reason why we might lose something of our understanding as to the nature of God’s lavish blessing and therefore run the risk of failing to grasp the enormity of what God has done for us, could possibly be because we have formed the wrong idea as to why it is that God bestowed His blessing on us in the first place. Do you think it’s possible that we could be tempted to think that we are deserving of God’s favour to some degree or another ? Now in order to expose and challenge that possible train of thought Paul at the start of Ch.2 completely changes the focus of his writing. He moves quickly away from the breathtakingly wide panorama of God’s blessing and focuses down with pinpoint precision to reveal in stark uncompromising language the devastatingly bleak spiritual common denominator for all humanity. And he does this to remind us that we will never be able to praise and worship God as we should, thanking Him for what He has done for us in Christ, if we lose sight of the depths of sinful rebellion from which God has saved us. And that’s why I’d like us to consider our passage this morning by focusing in on God’s grace to us; the theme that has permeated our sung worship this morning. The Bible has a lot to say about grace and Paul mentions the word twelve times in this short letter but there’s no way we have time this morning to even scratch the surface to reveal much about what the Bible means by such a multi-faceted doctrine as grace. But it’s clear from the verses that we have read, that the specific nature of grace that’s in view here in these verses is God’s saving grace. So whilst defining God’s grace in totality is notoriously difficult, I would suggest that we can have a good go at describing God’s saving grace. So let’s take another look at our passage and see the works of God’s saving grace through examining the past, present and future experience of those who profess Jesus Christ to be their Saviour and Lord. Let’s read those few verses again, ‘… as for you, you were dead in your transgressions and sins, in which you used to live when you followed the ways of this world and of the ruler of the Kingdom of the air, the spirit who is now at work in those who are disobedient. All of us also lived among them at one time, gratifying the cravings of our sinful nature and following its desires and thoughts. Like the rest we were by nature objects of wrath …’ (vs.1-3). The oldest lie of all, and we see evidence of it right back in the Garden of Eden, is the lie that says we can find freedom by ignoring God. But it’s foolishness. It’s rather like a goldfish believing it would enjoy a freer experience if only it could get out of its bowl. But, you and I know that’s nonsense, because the goldfish would just die. The reality is that God is the source of our freedom and not the end of our freedom. So when we ignore God we give ourselves over to slavery. And Paul goes on to say that there are three types of slavery. SLIDE 9 Firstly, slavery to the world; where the norms and expectations of our godless society heap a variety of pressures upon us such that we end up conforming to certain modes of behaviour that are in conflict with God’s intention for our lives. Secondly, and more sinisterly, there is slavery to the devil; that one who is the hidden orchestrator of everything that is both evil and destructive. And then thirdly, there is slavery to ourselves, where we act upon instinct where every sinful action only serves to make the next sin easier. And being guilty, says Paul, finds us objects of God’s wrath. I guess God’s wrath isn’t something that we think or speak about much but it’s an important part of who God is. SLIDE 11 John Stott writes this definition, ‘… God’s wrath is His personal, righteous, constant hostility to evil … it is His settled refusal to compromise with it … and it is His resolve instead to condemn it …’. And yet, amazingly, as we shall see as we move into vs.4, God’s wrath is not incompatible with God’s love, since both the wrath that judges and the grace that saves are personal attributes of the same One true God. Right at the start of vs.4 our attention is grabbed by one very small yet unbelievably pivotal word; a word that alters everything, a word that acts as the fulcrum that re-orientates humanity; the word but. Paul writes, ‘… but because of his great love for us, God who is rich in mercy, made us alive with Christ …’ (vs.4-5a). First of all we see the motive of God’s grace, it’s because of His love for us, then we see the source of His grace, its all about God’s mercy and then Paul tells us about the means of God’s grace, its the work of salvation that makes us, ‘… alive with Christ …’. And all of a sudden, all those things that we saw from those earlier verses as being humanly speaking unassailable difficulties, those things that keep us outside of God’s Kingdom, are remarkably resolved and transformed. It’s important to notice that we aren’t saved by God’s love but rather we are saved by the outworking of His love; God’s love in action, His grace and His mercy as revealed in the sacrificial death of the Lord Jesus Christ. But there’s something more that we can’t ignore since there is work going on, albeit not work that attains our salvation, but let’s read that last verse again. SLIDE 16 Paul writes, ‘… for we are God’s workmanship, created in Christ Jesus to do good works, which God prepared in advance for us to do …’ (vs.10). There’s a dual work that God continues to do in the lives of all those who love and trust him. God is working in us through His Spirit. Whereas Jesus finished the work of salvation on the cross, the work of the Holy Spirit continues day by day as God seeks to shape everything about us to make us more Christ-like. If we were to turn back in our Bibles to John’s gospel and Ch.11 we would read the story of Jesus bringing Lazarus back to life, and I often think of that story as a very visual reminder that the work of salvation in my life isn’t the only important experience. You’ll know the story I’m sure. The grave having been opened, SLIDE 17 Jesus stands at the entrance and calls to Lazarus to come out. And whilst the miracle of bringing Lazarus back to life is amazing it’s Jesus’ next words that are just as crucial, ‘… take off the grave clothes and let him go …’ (vs.44). In affect what Jesus is saying is, this man is alive, so now free him so that he can live. We need to ask God to get us out of our grave clothes and ask Him to help us put on our grace clothes. That is the work of God in us through His Spirit. Previously, as we saw in vs.2, it was the devil that was at work in us, but now it is God, through the person and work of the indwelling Spirit. But I said just now that it’s a dual work that God continues to do in our lives and we see evidence of that in the final half of this last verse since not only does God work in us but also God works through us. SLIDE 20 There are the good works that God has purposed that we should be doing. These aren’t works that bring glory to ourselves but rather these are the things that we do that prompt people to question what motivates us. These are works that bring glory to God and point those who don’t know the saving grace of the Lord Jesus Christ in their lives as yet towards Him. This is a re-statement of what Jesus said previously in words from the Sermon on the Mount that we read near the start of Matthew’s gospel. SLIDE 21 Jesus said, ‘… let your light shine before me, that they may see your good deeds and praise your Father in heaven …’ (Matthew Ch.4 vs.16). These are actions born out of lives and hearts that are overwhelmingly grateful to God who saved them. SLIDE 22 There’s so much more we could say about this passage and I was intending to point you towards a story in the OT that in narrative form wonderfully illustrates these verses that we have considered this morning but I think I’ll put up the reference and encourage you to go home and read that story for yourself and let you draw the parallels and explore the richness of the analogies it reveals. SLIDE 23 So let’s simply close by reviewing what we have learned together this morning. Without God you are I are without hope. But through the work of salvation as an act of God’s mercy and grace our lives can be transformed if we turn away from our rebellion of God, admit the hopelessness of our situation, admit our sinfulness and accept God’s offer of rescue. We were dead, enslaved and guilty. But we can be made alive, free and acquitted from the judgement and punishment of God’s wrath. The question is have we ? SLIDE 24 Let me leave you with a few questions to take away and think over. Is sin working against you because you have not as yet experienced Christ’s saving power ? Are you experiencing God’s work for you, in you and through you ? Are you wearing grave clothes or grace clothes ? As a Christian are you living out the position you have in Christ through seeking to serve Him ? May God continue to pour out His grace to us as we continue day by day to know him more and more.